When Margie Bauer joins the Army Nurse Corps in 1941, she is delighted to be sent to Manila, the Pearl of the Orient. Though rumors of war circulate, she feels safe, trusting the island is fortified and the Filipino troops are well trained. On December 8, 1941, her dreamworld shatters when the Japanese invade the Philippines. The US Army evacuates to the Bataan Peninsula, where she cares for the wounded soldiers in a field hospital, and then in a catacomb of tunnels on Corregidor Island. Ultimately captured, she is interned in Santo Tomas, a Japanese prison camp, where for three years she endures escalating danger, starvation, and loss. 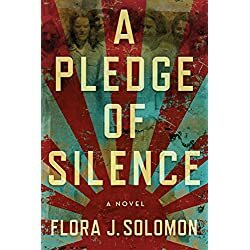 At once an epic tale of a nation at war and the deeply personal story of one woman’s intense journey, A Pledge of Silence vividly illustrates the sacrifices the Greatest Generation made for their country, and the price they continued to pay long after the war ended.